Graham Corporation (GHM) is a company located almost in my backyard, so to speak, so it was with interest that I reviewed their third quarter earnings announcement this morning. Graham is a small-cap company in the industrial sector. They are an equipment manufacturer for the oil refinery, petrochemical, power generation, fertilizer and pharmaceutical industries, etc. Its products include steam jet ejector vacuum systems; surface condensers for steam turbines; vacuum pumps and compressors and various types of heat exchangers. Sales were up $6 million over the previous year's quarter but down $3 million sequentially. Net income for the third quarter was $3.8 million, or $0.74 earnings per diluted share, compared with $666 thousand, or $0.14 earnings per diluted share, in the prior year's third quarter. On a sequential basis, earnings were down $600 thousand compared to the previous quarter. Domestic sales were 52% of total sales for the third quarter of fiscal 2008 compared with 61% in the same period the prior fiscal year. The company seems to be benefiting from the weak dollar and robust exports. Sales for the first nine months of fiscal 2008 were $63.7 million, up 41% compared with $45.0 million in the first nine months of fiscal 2007. Gross profit margin for the first nine months of fiscal 2008 was 40% compared with 24% for the first nine months of the prior fiscal year. Orders for the first nine months of fiscal 2008 were up 21% compared with the first nine months of fiscal 2007. Backlog was at a record level, up 32% as of the end of 2007 as compared to year-end 2006. Management addressed the issue of sequential performance appearing to be weakening by emphasizing that timing of order acceptance can significantly impact any particular reporting period; hence, a sequential dip does not necessarily imply a bad trend developing. So far, everything sounds pretty good. But the stock fell almost 14% today, closing at $30. What gives? “It is important to note that capacity constraints at the engineering contractors and end users, which includes skilled human resource limitations, combined with cost creep, are extending the planning and execution cycle for many projects which in turn has impacted the pace of projects and procurement patterns. Additionally, there has been a step-up in foreign competition in our core markets which in turn may result in more competitive bid processes and lower margin potential. We continue to guide expectations for sustained gross margins to be in the mid-30% range in the next fiscal year, which incorporates the change in mix and increased competition in the market offset by productivity enhancements." Ah, a cautious note. An acknowledgment, really, that the business environment will be tough and the company, though it is well positioned to grow, could just as easily end up with flat results. Given the skittishness of the markets these days, that's all it took to sink the stock and confirm a very bearish chart (see below). As can be seen, the stock dipped below an important support level at $40 but managed to climb back above that level. 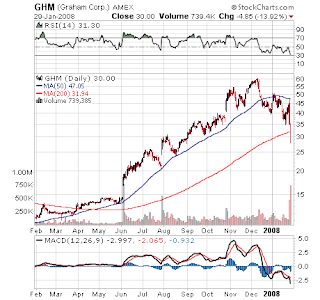 Yesterday's and today's price action, however, have driven GHM below the support and below its 200-day moving average. Things are looking pretty ugly now. I would like to be able to recommend the local boys but with a chart like this, it will be best to avoid Graham Corp. for the time being. do trading due to which in recent past we have seen few shares which are fundamentally very week but had flied high in rally. But now everyone is trapped in those sort of companies. Now best strategy is to wait and watch let Nifty close above 5350-5400 for 1-2 days only then strength will come back in market. We are expecting short covering above these levels. Till then our approach should be wait and watch trade in less quantity.